or...i could be here awhile! a couple of things stand out to me this week. one is that i'm doing my usual schizo spinning. 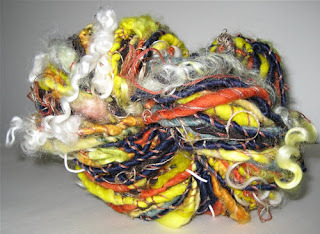 i spin some big mufti skein, and then...whoa, i'm spinning something that has about 5 bazillion yards in a skein. 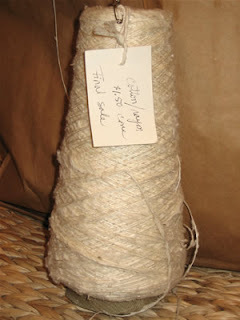 and the other thing, also curiously involving the bobbin of white-ish stuff, is that, while spinning it, there is something that i see out of the corner of my eye: a spool of thread purchased recently. 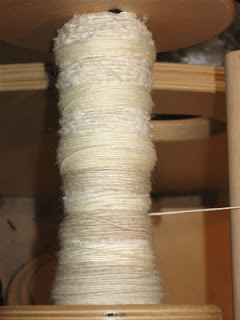 (note tag) now the bobbin i'm spinning has silk noil, mongolian lambswool/silk, cashmere, silk/cashmere mix, tussah silk and alpaca, and has taken many hours. the "final sale $1.50" tag keeps niggling at me. does anybody know what goes into this spinning thing?